While Forest of a Thousand Lanterns was a dark, imaginative retelling, Kingdom of the Blazing Phoenix takes after the adventurous folklore I grew up with. In fact, the book reminded me so much of a Japanese folklore, Momotaro. I read Kingdom as a child would their favorite bedtime story; unlike its predecessor Kingdom‘s storyline read like a fable with each scene imparting a specific moral for readers to take away. This book is definitely an easier read than Forest not only because it is far more adventurous but also how it sticks to the traditional fairytale plot-line. But, of course, it would not do to compare these two books because, although they are of a single series, Kingdom of the Blazing Phoenix and Forest of a Thousand Lanterns uniquely contrast each other. During the first quarter of Kingdom we are introduced to Empress Xifeng. Our power hungry anti-heroine has changed so much since her story in Forest. Here, we have two women whose lives are tightly entwined to each other’s destiny; I loved reading how different Julie C. Dao interpreted choice and fate with these two characters. While Xifeng has allowed fate to shape her life, Princess Jade shapes fate to the life she believes in. Princess Jade is an easily likable character who is trying to do right by her kingdom. She is definitely a heroine out of a fairytale – pure of heart and compassionate. At first, I thought these made her quite a typical fairy-tale heroine which isn’t necessarily a bad thing. For without compassion Jade would not have completed each of the tasks on her quest. Without compassion, Jade might not have had her relationship sisterly relationship with Wren. What I loved most about Kingdom was how beautifully Dao wrote of history and mythology; the way she gave importance to folktales is a reminder to the simplicity of human life. Traditional stories are not simply for entertainment but a means of instilling cultural traditions. How one is shaped often comes back to the stories they cherish most. As we travel with Jade through luscious lands inspired by East Asia, we also follow on her own emotional quest; just as Jade ruminated over her own purpose so do we as readers begin to understand that fate is not set path. Though we follow it, the choices we make are our own. The morals we learn and take with us are our own. What are we willing to fight for? What are we willing to sacrifice? Julie C. Dao has certainly established herself as one of my favourite writers. I simply cannot get enough of her books. To me, reading Forest and Kingdom has felt much like home. I love the humility in her stories, the dreams in her prose, the difficult characters she brings to life, and the homage she pays to Asian culture. 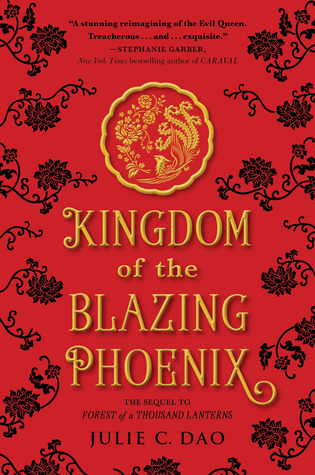 Disclaimer: I received an ARC from Penguin Random House International as part of a PH blog tour organized by The Royal Polar Bear Reads and The Nocturnal Fey for Kingdom of the Blazing Phoenix. However, this does not affect my opinion of the book. Which is your favourite book that is set in your country?